Warm weather isn’t the only time for an easy, breezy short haircut! The debate continues to rage whether long or short hair is easier to style and maintain. Well, for all you short hair -wearers, here are some styling tips. To begin, start at the crown and use your brush and dryer to lift your hair up, back and over the crown to control cowlicks. Next, go to the bangs or front fringe and using your brush direct your hair to the desired side. Textured & Tousled – Put down the brush and use your fingers to work the hair in a circular motion with one hand while drying with the other. This creates the most fullness. Complete the look with a molding paste or wax or a non-aerosol hairspray. Straight – Lean over and brush and dry the underside of your hair beginning at the back of your neck. Style the crown and bangs as described previously. If the style is longer in front and short at the nape of the neck, continue using the brush and dryer to direct the hair down and under from the top. Avoid brushing the hair back from the face while drying, because the desired fullness will not be achieved. Finish with a straight iron or large curling iron and a shine serum. 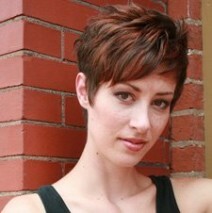 Check out Statements in Hair’s Facebook page for lots of short haircut photos – textured and straight! You are always welcome to make an appointment for a consultation – it’s free!